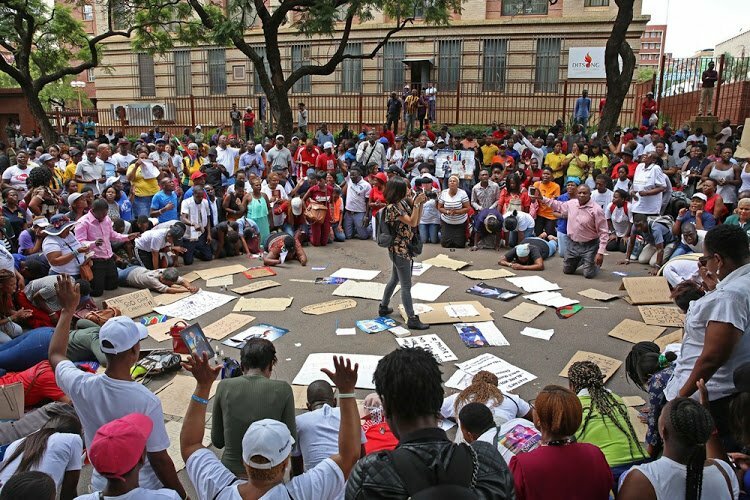 04 February 2019: Followers of Shepherd Bushiri came out in their numbers to support him as he appeared in the Pretoria Specialised Commercial Crimes Court with his wife on February 4 2019. Bushiri has hired Oscar Pistorius advocate Barry Roux to represent him and his wife Mary. Picture: Thapelo Morebudi/The Sunday Times. Prophet Shepherd Bushiri who has been selling anointing oil to his followers including appointments for prayers is in hot soup for hiring one of the most expensive criminal lawyers, Barry Roux, as a lead defense attorney. Bushiri was arrested on Friday together with his wife for alleged fraud and money laundering and has acquired the services of top defence advocate Barry Roux whose daily fees is reportedly close to R50 000. Hiring of Roux who gained fame when he defended murder convict Paralympian Oscar Pistorius in 2014 has landed the Malawian born televangelist in trouble with some people accusing him of being a fake prophet. Writing on Facebook, Gitta Phiri said: “Same lawyer that represented a murder will representing a prophet. “Life is: Prophet hires a prominent lawyer to defend him while his brainwashed people uses his water when in trouble” posted Raynolds Liabunya on social media. Jozi News, one of the tabloids in South Africa accused Bushiri of disregarding his anointing oil in a story headlined Self Proclaimed Prophet Shepherd Bushiri Prefer Barry Roux Over His Anointing Oil. South Africa’s renown advocate and whistleblower, Man’s Not Barry Roux who tweets at AdvBarryRoux alleged that Bushiri’s followers will foot the embattled prophet’s legal bills. “So, Barry Roux has displaced Annointed Oil?…Now it’s no longer ‘Jesus fights our battles, no stress’ but ‘Barry Roux will try his best to fight out battles’!.. conmen in times of difficulties and tribulations will jump onto fellow men for help. This how you can know them” another commented. But Bushiri’s Communications Director, Ephraim Nyondo, said that Roux has always been a family attorney. “There is no change in the usual legal team of Prophet Shepherd Bushiri’s as he goes for bail hearing tomorrow with South Africa’s top advocate Barry Roux, again, leading ECG leader’s defense team. Advocate Roux has always been Bushiri’s family lawyer” said Nyondo. Bushiri and his wife are expected to appear in court this morning to file for bail. Why this man is entertained and discussed is beyond me. Meanwhile in Scotland ???????????????????????????? I’m ready to get to work after a passionate day with my other half last night. My point is – deport him end of. No buddle of your naughtiness namanje ba mushota,is nick a chibola? I thought O.J .Simpsons lawyer is the best in the world. Despite several warnings in the bible about false prophets, people still choose to follow them and willingly get brainwashed and crooked out of their money. Bushiri is clearly a servant of evil. A Deceiver. And yet people flock to him. We black people have dangerously misunderstood religion. Sadly, many folks are deluded in faith. That boy they call Prophet is nothing but a horrible criminal manipulating them in the name of Christianity He is a con-artist. All you followers, why did jesus not hire an earthly lawyer when he was persecuted, instead he let God Judge and not man. zealot sycophants do your math. Zambia has good lawyers for such cases . count how many politicians got arrested for “corruption” and went to jail? Even a mere civil servant walk to freedom. Just yesterday some guy called Ronald Ch, was arrested and released back in jungle. @ Senior Citizen, I’m not sure what “being black” has do with it. There are plenty of horrible criminals manipulating people in the name of Christianity (and other faiths!) all over the world. The full quote from Karl Marx translates as: “Religion is the sigh of the oppressed creature, the heart of a heartless world, and the soul of soulless conditions. It is the opium of the people”. Someone answer me candidly, what will the so called prophets prophesy? Where will their prophecy be written? Is it not true that from the time the last book in the Bible was written there has been an endless list of those who masqueraded as prophets to date? What are their names? Where are their prophesies written? Do we really need any more prophesies other than those already in the Bible? @Spade. Just read the last chapter of Chinua Achebe’s “Things Fall Apart” . It is a story but it explains what we had before the “holy book” arrived and we threw away what we had. Do not get me wrong, I worship. Only I worship the God of my ancestors and not some bs somebody brought and used it to take over the continent. The sad thing is that it has been taken over by our own kindred and boy, are they doing it well! And yes, I will gladly burn in hell. Will come back and tell y’all about the experience. One who can provide miracles to others can simply confuse the arresting officers, curse them and send them running into the ocean. …but alas this a simple conman who also duped some people in emeralds mining area of Lufwanyama. These people have been left broke and broken by this miracle worker. Why have a family criminal lawyer and very expensive one for that matter if your ways are clean? We are talking oF R50, 000 daily fee. I thought the holy spirit was going to speak for him if he was holy. A man of little faith. If you play in the mad, dirt should not surprise you. Why has he placed faith in man and not God? Does it mean for him his own anointing oil and water cant work but they do for others? Really only God knows ….I end here. The same conman, I hear convinced one of our promising Politician to resign, telling him that, that was the only way to ascend to presidency … I pity with my form honorable politician… I liked him very much and even thought that he will takeover from ECL.. Poor Zambian politician. Please come back to PF.. We will forgive you for being misled. Can’t feel sorry for his stubborn and blind followers. They believe this criminal more than anyone/anything. Even if the real creator of heaven and earth came to tell the the truth, they would not accept. #Babylon burn and fall..
Do people really read the Bible? Indeed are the last days. Bushiri is in trouble indeed. HAWKS do not arrest then investigate. They have a case against him. That is why I lost respect for the young man Harry Kalaba, how can you seriously be a disciple of Bushiri and be taken seriously by us Zambians??? Comment:if u trust God with whole your heart, things will be easy for for u.trust him wherever u are!!! Comment:do not judge, only God who can judge. Comment:if u are willing to become as a pastor, don’t think that u will be loved by everyone no, when troubles come keep on praying.